Safe Buy Spain is an organization that was initiated by a group of like-minded real estate professionals on the inland Costa Blanca South and Murcia regions of Spain. Disillusioned by the lack of regulation, ethics and professionalism shown by many unregistered agents the SBS was started to act as a common voice of established, legal, tax paying agents. The SBS is a no n-profit group and unlike other similar organizations does not charge members a fee for joining. Membership of SBS is based on the real estate agents references from clients, their time in the industry, their legal status and most importantly of all their impeccable reputation for offering first class service to their clients. This community of agents and their support network will uphold the highest standards and this initiative has been backed by banks, insurance companies, finance companies, lawyers and architects. Members of the SBS all subscribe to the following mission statement and code of ethics. At all times act with honesty, transparency and fully within the legal framework covering the buying and selling of property within Spain. Act as a common voice of the established subscribed real estate professionals in Inland and Coastal Alicante and Murcia. Enhance professionalism and ethical conduct at all times. Offer clients at all times the best and impartial advice available to them. Ensure that all resale properties listed for sale are checked to ensure conformity to regulations and ensure that all documentation is in order and available for buyers lawyers. Ensure that all new and off plan properties conform entirely to the laws governing the build and sale of such properties. Ensure that all client monies are held in governed client accounts or escrow accounts and full transparency and traceability is observed. Have written consent with the vendors to list the property for sale, to advertise and market the property in an accurate and honest manner. Provide an independent network team of trusted real estate industry professionals, bankers, lawyers, builders, tradespeople and architects that are at the disposal of our clients should they be required. Safe Buy Spain was an idea that had been thought about over many years by a select group of agents who were tiring of the poor standards and ethics of certain agents in the area. The group initially met in early 2017 however the demands of busy agencies meant that the group was only officially formed in late 2017 with the original 3 founding members and 2 further agents who were asked to join the group. All participating agents offer identical standards of customer service, honesty and integrity and regardless of who you choose to find your dream home you are guaranteed a first class service with your trust in our hands………..
We are not under the illusion that we are speaking for the entire industry, we just want our customers to have the confidence that there is a group of like minded agents who aspire to the highest standards and that should you choose to work with any of us, you will receive the same levels of customer service, attention to detail, trustworthiness and honesty. 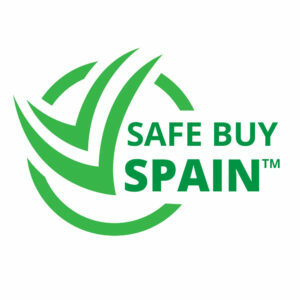 The Safe Buy Spain logo can only be used by authorised and certified members. If you see the logo on an agents website you can always check their status by visiting www.SafeBuySpain.com and checking the members page.